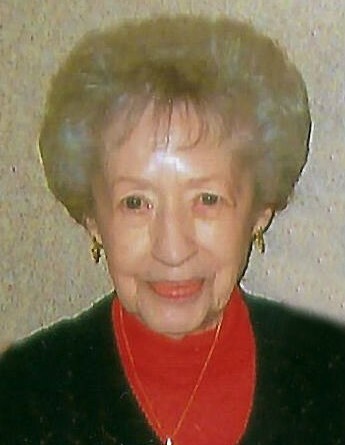 Audrey Imagene (Wright) Halgren, age 96, of Wells, MI passed away Friday, September 14, 2018 at her home. She was born on May 9, 1922 in Monroe, TN to William Alfred and Ida (Winningham) Wright. Audrey was the second of three children. Her older half-brother, Leamon (Gencie) Wright, herself, and her younger sister, Vivien Marie (Wright) Reidling. Audrey began working after school in the evenings and Saturdays as a sales clerk. She was a graduate of Southeastern High School in Detroit. Audrey continued working secretarial positions, including a position for the War Department in 1942. Her last secretarial and supervisory position was for Martin Electric from 1949 until 1969. Audrey married Kenneth A. Halgren in Detroit on February 15, 1946. They had two daughters, Marcia and Lisa Ann. In 1969, Audrey and Kenny moved from Detroit to Wells. They purchased the Idle Hour Bar and she operated the thriving neighborhood tavern from 1970 until 1997. Audrey volunteered as a senior companion at Christian Park Healthcare Center for many years, was an avid pinochle and cribbage player, enjoyed pressing her luck at the casino, and loved spending time with her family and friends. Audrey is survived by her daughter, Marcia (Harold) Johnson of Austin, MN; granddaughters, Dawn Marie (Hart) Harrison of Las Vegas, NV, and Michelle (Chad) Groh of Austin, MN; grandson, Sean (Sara) Johnson of Chaska, MN; six beautiful and loving great-grandchildren in chronological order, Aunica Groh, Ethan Groh, Mia Johnson, Luke Johnson, Caden Groh, and Ashlynn Groh; Audrey’s younger sister, Marie Reidling of Gainesville, FL; nieces, Becky (Cliff) Preston of Gainesville, FL, and Teri (Kurt) Milner of Boca Raton, FL; and many great nieces and nephews. In addition to her parents and husband, Audrey was preceded in death by her daughter, Lisa Ann Halgren; brother-in-law, Ed Reidling; nephew, Mark E. Reidling; and great-niece, Heather Rubino. A celebration of life in Audrey’s honor will be held from 3:00 p.m. to 5:00 p.m., Sunday, September 23, 2018 at the Bark River Bible Church where cake and coffee will also be served during the get-together.